As part of my job, I had to spend a whole week in the Yuma, AZ area. One of the brighter spots of Yuma is that it’s one of the best places to get good authentic Mexican food (without the usual Tex Mex or New Mexico influences, which are good in their own right, but not true Mexican Food). I’ve known several good places in Yuma (including Mi Rancho, which has been around forever), and several good taco stands, but I wanted to see what the best Mexican food out there was. Consulting several online sources (Chowhound, FindItinYuma, and several blogs), there was quite a consensus that Los Manjares was the place to try first. So I did. After a fairly long drive from Phoenix (with the obligatory stop in Dateland, AZ for a Date Shake) and getting settled into my hotel, I drove across town to Los Manjares. It’s quite the low-key location, a small converted house with the sign at right on 4th St announcing it’s locations. 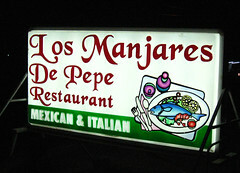 The menu is pretty typical Mexican, with Carnitas, Carne el Pastor, several good Caldos, several Pollo dishes, etc. 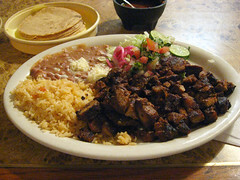 The two dishes I had were the Carne el Pastor (at right) and the Pollo Sinaloa. Both were excellent, flavorful, and nicely spiced, and both were the finest examples of those dishes I’ve ever had (no exaggeration here). Living in New England, I’ve grown used to having bland steamed and stringy chicken and tough pork, and I’m glad that’s not the case here. Both dishes were cooked perfectly, spiced perfectly, and served with nicely executed side dishes (refritos and rice). 1. Seriously, I had the best Carne El Pastor I’ve ever had. Perfect preparation, with good spice and a good char. 2. Everything else I had was top-notch as well, from the Pollo Sinaloa (I went back another evening), to the beans, to the rice, and even the margaritas. The kitchen here is defintely hitting on all cylinders. 3. The cuisine is about as authentic Mexican as you can easily get in the US. 4. Friendly staff. On both visits the staff was very friendly and attentive. 1. Good food can take time. On my second visit, it took a good half hour for my food to come out. Still worth the wait. After returning to London (via an unanticipated extra night’s layover in Madrid, courtesy of Iberia Airlines), my brother and his wife decidd to celebrate our return to the UK by taking took us out to Roast. Nestled nicely above Borough Market in what used to be the portico of the Flower Market, it’s a really pleasant and open dining space, and a restaurant known for high quality roasted meats, including game meats (“warning, may contain shot”). Their motto is “Deliciously British,” and they pursue this with classical British cooking (think roasts, games, and classic British desserts) using the seasonal produce and locally-procured meats.